Human Rights, Refugees, Social History and Environmental issues are regular subjects of Palewell Press books. As independent publishers, we're committed to publishing our authors' honestly held views about these subjects. The dividing line between an individual's personal views and the citizen's behaviour is a vital one. But, as Editors at Palewell Press, it is also important to acknowledge our own views. On this page we reproduce our newsletter editorials, blogs and research articles about subjects in the news. The UN Intergovernmental Panel (IPCC) latest report on Climate Change says urgent and unprecedented action is required to keep global temperatures between 1.5C and 2C - only 12 years remain to achieve this. Beyond that point, even half a degree warmer will significantly worsen the risks of drought, floods, extreme heat and poverty for hundreds of millions of people. Avoiding this additional half-degree could also prevent corals from extinction and ease pressure on the Arctic. As the report was approved by a plenary of all 195 countries in Incheon in South Korea, delegates hugged one another, some of them in tears. Despite the stark warning, the USA and Brazil are expected to withdraw from the accord. It can seem as if all these decisions will be made by governments but individuals play an important part too. One of our climate heroes is Jadav Payeng in India. Through planting one tree every day for 37 years on the barren sandbar island in the Brahmaputra river, he has recreated a 1360 acre forest that today is home to wildlife. Halt fossil fuel expansion and fossil fuel subsidies by 2020 and begin to support the roll-out of clean renewable energy technologies immediately. Ensure current and future policies are consistent with averting climate change and preventing ecological collapse. Support the rapidly emerging climate action plans and resilience initiatives throughout the country. Reduce carbon emissions to net zero no later than 2030. This quotation from The Book of Hosea in the Old Testament shows an awareness of environmental challenges similar to those we face today. Hosea was speaking metaphorically but also as someone familiar with over-tilled land washing away in storm or blowing up into dust spirals. Adam Horovitz’s poetry collection The Soil Never Sleeps contains this warning: “…if we whisk up soups in chemical vats to tame the weeds, we strip the landscape of its language. Make a bowl in which to harvest storms.” (The Abattoir). as we can manage in field or office, city street or farm. Yonas Kinde is a refugee marathon runner from Ethiopia and was part of the Olympic Refugee Team competing in Rio. In his relatively short running career in Europe he's gained titles in Luxembourg, France and Germany but couldn't enter major competitions because of his lack of citizenship. So the opportunity to be part of the Olympic Refugee Team was welcome. Like many refugees, he finds it hard to talk about why he had to leave Ethiopia. Even in Luxembourg he's had to live under international protection since 2013. Adjusting to life as a refugee has been a challenge but it's clear that running always makes him happy. Kinde did well, reaching the Olympics Marathon Final and finishing in 2:24:08. 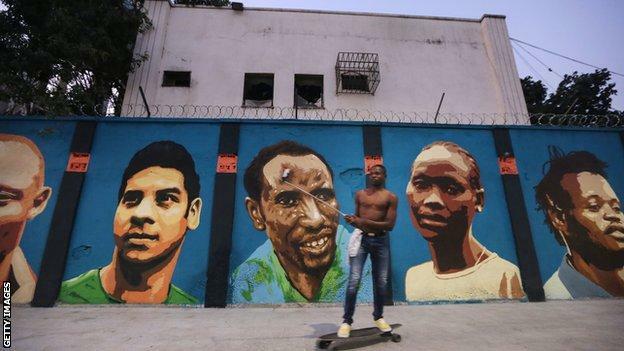 The photo at the top of the page is of a new mural in Rio, painted by artists Rodrigo Sini and Cety Soledade and celebrating the first Olympic Refugee Team. Sharing ideas or selling books? Grenfell - Where do we go from here? What is Independent Publishing For?